Today we have set ourselves two goals, we want to visit the castles of Craigievar and Fraser. The area is full of castles but most are private possession and can't be seen from the road. Their presence is betrayed by walls along the road and occasionally a gatehouse or a long driveway. But first we look at the remains of Castle Glenbuchat, built around 1590. The valley where the castle is also called Glen Perfect because it provided everything you need to live, whether you were a lord of the castle, a smuggler or a poacher. We follow again the river Don and we see more and more blue in the sky. It is also a bit warmer than yesterday, who knows the weather might turn out allright today. The first few years in Scotland we have experienced very little rain, in recent years we had to make up for that, so it seems. Cold is not that bad in itself, you can dress against that but with rain it is just not any fun to walk around and everything looks just grayer. The landscapes in Scotland are also difficult to photograph then. 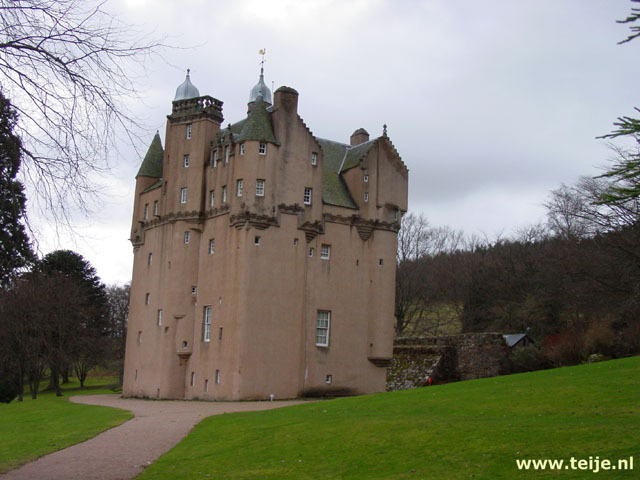 Castle Craigievar is a real fairytale castle and looks very different from many other castles, although it has some resemblance to the one in Braemar. It occupies a fairly small area and is mainly built in height. In the sun, it is beautiful with the pink color, really a princess castle and it is said that Walt Disney had this castle in mind for the design of the castle of Cinderella. The bottom looks very solid with very few windows but that is compensated by all the turrets and decorations at the top. The 7-storey castle was completed in 1626, although in the 15th century there was already mention of a castle on this site. At the beginning of the 19th century, the castle was considerably dilapidated and the then owner, Sir John Forbes, even thought about breaking it down completely. Fortunately there was an architect from Aberdeen who pointed out that the castle was one of the most refined examples of castles from the 17th century in this style. The building is now owned by the National Trust and accessible to the public (between Easter and the end of September). There are only guided tours in a group of up to 10 people, so walking around on your own is not possible. We always like to wander around a bit ourselves. Inside, a large amount of historical objects can be seen and no artificial light is used on the higher floors. The gardens around the castle are also wonderful to wander through, especially now that the sun is shining and it is getting warmer too. We have seen the castle at least once inside (perhaps more often) so we only take a walk. There are several signposted hikes. Then we drive through rural roads to Aboyne where we take a break on an outdoor terrace and then to castle Fraser. Castle Fraser looks very different from Craigievar, much larger, sturdy and less high, with a gate and large courtyard. It got its current form in the 16th century so in the same time as Craigievar. Because we can not remember if we ever visited it inside, we are going to do that today. The castle is decorated as if it were still inhabited with lots of objects from the past centuries and as much as possible from the Fraser family itself. Here we are aloowed to take photographs and we do that extensively of which you can see a few pictures here. In 1897 the last male Fraser died and eventually the castle ended up in the hands of the National Trust. There are also enough spirits here, like that of a young princess who was brutally murdered in the Green Room. Her bleeding body was dragged down the stairs but the blood could not be washed form the stairs. That is why these stairs are finished with wood and they still are (probably it was easier to climb them). At night the princess wanders around the hall but there is also a lady in black who once died here of tuberculosis. As we walk from floor to floor we see more and more pieces of Scotland's history and signs pointing to the various secret corridors that have been laid out. For example, the Laird's Lug (ear of the lord) is a ventilation channel through which the landlord could understand what his guests in the Great Hall said to each other downstairs. You can find something similar in many more castles. So, watch out what you say aloud. From the roof we have a beautiful view over the courtyard and the surrounding gardens. Through another side we walk down again and pass a bedroom with a very handy bedpan, almost a real toilet next to your bed. I think that is ideal to have! When we are outside again, we take a short walk over the estate but you can walk around here for much longer, there is more than one square kilometer of gardens. There must still be a stone circle in the area somewhere, but we do not find it. These are two very beautiful castles that are not too far away from each other and which are certainly worth a visit. But the whole region is full of castles, so there are many more out of which you can make a choice. But do count on at least &pond; 10 access fee per person if it is managed by the National Trust of Scotland. 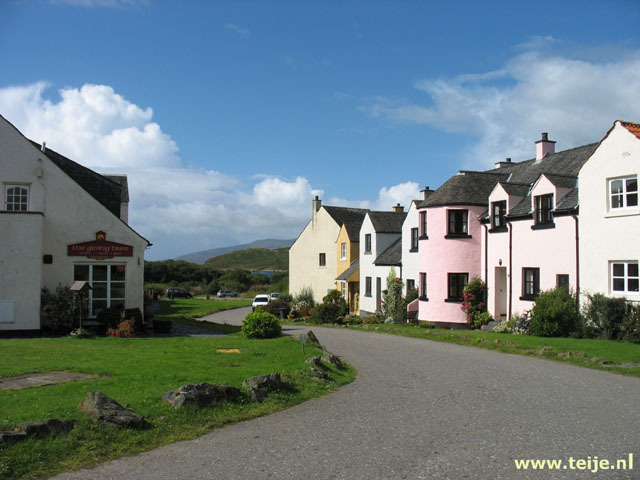 Our experience is that the counterpart, the Historic Scotland, uses lower prices. Of course we take different roads when we drive back to our house so that Teije can mark more roads on his map to show that we have been there. We have made it a very active day (for us, at least) and we are tired of walking and climbing all the stairs in the castles. Fortunately the weather is warmer, dry and sunny, now we can sit outside on our terrace for a long time in the evening.